Taxonomy: Pistol Shrimp belongs to the Kingdom Animalia, Phylum Arthropoda, Class Crustacea, Order Decapoda, Family Alpheidae and Genus Alpheus. 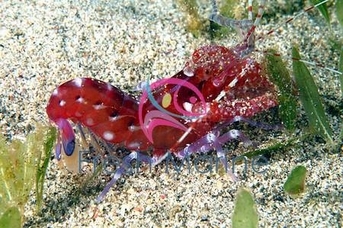 Scientific names: The scientific name of Pistol Shrimp is Alpheus species. Other common names: Pistol Shrimp is also commonly known as Symbiosis Shrimp and Snapping Shrimp. Origin or natural range: The Alpheus species originates in the tropical region including Caribbean and Baja California. Size: Pistol Shrimp grows up to a maximum size of around three inches. Color: The Alpheus species occurs in varied colors. Compatibility: Pistol Shrimp is non-aggressive towards the marine aquarium members. When pincher of the Alpheus species opens or closes, it expels water. During this process, an appendage makes a sound like a pistol and therefore the name Pistol Shrimp. The Alpheus species shares a symbiotic relationship with gobies. Gobies have good eyesight and warn the shrimp of any nearby predators in the exchange of the food that Pistol Shrimp provides to their host, gobies. The Alpheus species may also get symbiotically associated with sponges, corals and anemones. Pistol Shrimp is the sole eusocial marine invertebrate. The Alpheus species also practice a division of labor in its group. There is a caste of queens that is protected by a caste called soldiers. These soldiers are larger in size than the rest of their colony members and protect their territory from any intruders including Pistol Shrimps of other colony. The Alpheus species molts as it outgrows its exoskeleton. In molting, Pistol Shrimp sheds its existing, tight shell to replace it with a new, larger one. The Alpheus species leaves its previous shell at a visible site to detract its predators while it hides away to allow its new exoskeleton to form completely and harden. Pistol Shrimp has two pairs of long and thin antennae, three segments of body and five pairs of legs. The antennae are a visionary tool for the Alpheus species. The head of Pistol Shrimp is connected to thorax. The thorax of the Alpheus species is covered with an exoskeleton, called Carapace. The abdomen of Pistol Shrimp is well designed to facilitate the animal's quick movement. The Alpheus species has two claws, one is pincher and the other one is snapper. The pinchers of male Pistol Shrimp are larger than that of its female counterpart. Breeding: The Alpheus species is monogamous in nature and lives and breeds in sponges. Illumination: Pistol Shrimp requires low illumination in the tank it inhabits. To host Pistol Shrimp, you should have a reef type marine aquarium with a minimum water capacity of thirty gallons. Your aquarium should also contain sand, coral, rocks and rock caves. The Alpheus species may take over an hour to acclimate to your reef tank's environment. Feeding & Nutrition: Pistol Shrimp is Omnivorous in feeding habit and eats detritus, phytoplankton, frozen meaty bits, brine shrimp, pellets and vegetable flakes. Benefits: The Alpheus species is a Scavenger and feeds upon detritus present in the sand, thereby keeping your marine aquarium free of any decaying organic matter. The Alpheus species is easy to maintain owing to its non-poisonous nature. Maintain ample Iodine quantity in the tank water to smoothen up Pistol Shrimp's molting process. Copper and Nitrates in tank water may prove lethal for the Alpheus species therein. Do not keep large predator fish and Pistol Shrimp in the same marine aquarium as the fish may kill the shrimp therein. To compensate for any missing nourishment, better feed the Alpheus species twice to thrice per week. Caution: Pistol Shrimp may attack shrimps smaller in size than itself. Therefore, do not keep very small sized shrimps and the Alpheus species in the same marine aquarium.